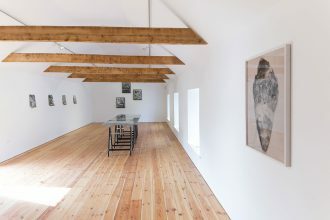 CAMPLE LINE is delighted to host SPOLIA, an exhibition by artist Lorna Macintyre, which brings together two recent photographic installations and a group of four new works made for our upstairs space. Amongst the works included there is a common focus on stone—its geographical sources and its material and tactile properties—and on the reuse and transformation of materials. Lorna’s choice of title for the exhibition—SPOLIA—invokes these preoccupations: stone, repurposing, transformation. A term that usually describes the reuse of building stone or architectural fragments in new contexts, Lorna’s re-purposing is applied to an array of physical artefacts—found stones, marble off-cuts and samples, ceramic forms, and crystallised obsolete everyday objects. Their arrangements are brought into poignant counterpoint with photographic images of rock formations at nearby Crichope Linn and of small geological specimens once held in Dr Grierson’s Museum at its New St location in Thornhill from 1872 to 1965 and now in Dumfries Museum.